Collecting data on all species is hard for any one even today. That’s why Wikimedia Foundation took care of it by developing Wikispecies.org. It’s the world’s largest catelogue of all species. It is “directed at scientists, rather than at the general public”. So I thought how to create a species catelog or a dictionary using PHP and MySQL using this huge species catelog using their API. Also it does not need any database. Just PHP can create a nice dictionary in our web site. That was the base to this script. 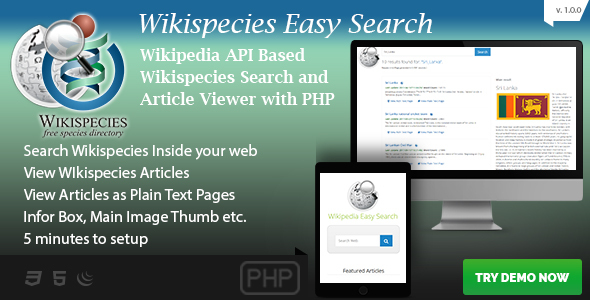 Wikispecies Easy Search is based on Wikipedia API. It gives you to have rich dictionary data on your website or web page. As the API is based on http request based, this script uses CURL command to get information from Wikipedia to a JSON array and manipulate those data in bootstrap based fron end. The script is very easy to understand and easy to edit. Even a basic PHP user can handle this script. View Pronounciation, Noun, Usage Noes, Synonms, Hypernyms, related terms etc.